It’s true, loving what you do makes it so much better. I couldn’t imagine the people that wake up everyday and start to get ready to go to a job that they hate, with people they don’t get on with and having to do something they don’t even enjoy. I’m guessing for most people that’s what work is, not for me, I am one of the lucky ones. This morning, I came into work, started researching Jellyfish and then was able to edit some great photos and video, provided to me by Steve Warren from Ocean Optics, a friend of a friend, who I’m sure would also agree with me about the whole loving his job. Steve grew up with friends of mine here in Gibraltar. At the age of fifteen, they used to go snorkeling, diving and generally spend most of their time in the water. Some years later (I won’t specify how many) Steve owns and runs Ocean Optics, a company specialising in underwater photography. in Gibraltar at the moment to film and photograph the Orca whales that are currently in the straits, Steve loves the diving here in Gibraltar, and believes there is so much more here than most people realise. 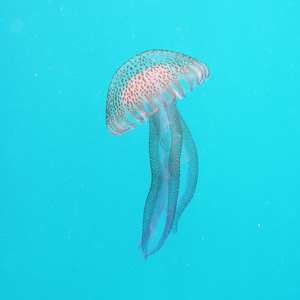 You can check out the first of the videos we created with Steve below, this one is just a short one with some footage and stills of the Jellyfish. You can see the full Eddie’s blog on the subject by clicking here.